Without water, life wouldn’t exist. For many of us, having clean drinking water has never really been a problem but in light of the Flint water crisis, it’s becoming more apparent that we need new and innovative ways to filter our water to remove particulates, pathogens and metals. This is exactly what MUV offers; an inexpensive way to have constant clean water. The MUV is unique in the fact that it is both modular and adaptable to whatever scenario you might find yourself in and is comprised of three different attachments that have different filtrations properties. MUV is both modular and adaptable which means that no where you are what you’re doing, it will suit your filtration needs. The MUV 1 contains activated carbon fiber and is used to remove chemicals, heavy metals and sediment. This is perfect if you just want to filter town water since this segment can filter 150 gallons of water. The MUV 2 contains hollow fiber that allows you to remove sediment as well as bacteria such as eColi, Cholera, Protozoan Cysts etc. This segment can also be back flushed and has a filtration capacity of 100,000 gallons. The MUV 3 contains Nanalum which has the ability to remove heavy metals, chemicals, bacteria, viruses (such as Typhoid, Hepatitis A etc. ), as well as sediment and can filter up to 90 gallons. The MUV was designed for everyday use; from hunting to jogging and even from town water to dirty river water. It will filter any water that you need with its three-part filtration system. 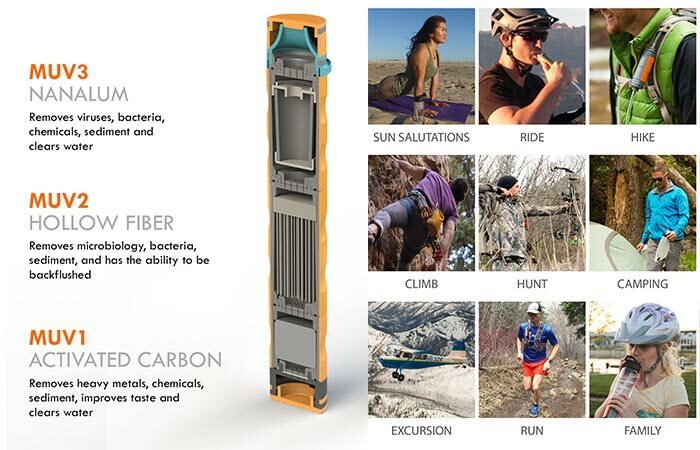 Since the MUV is modular, you can connect all three of these segments to get the ultimate filtration to make some of the most undrinkable water on the planet, drinkable. 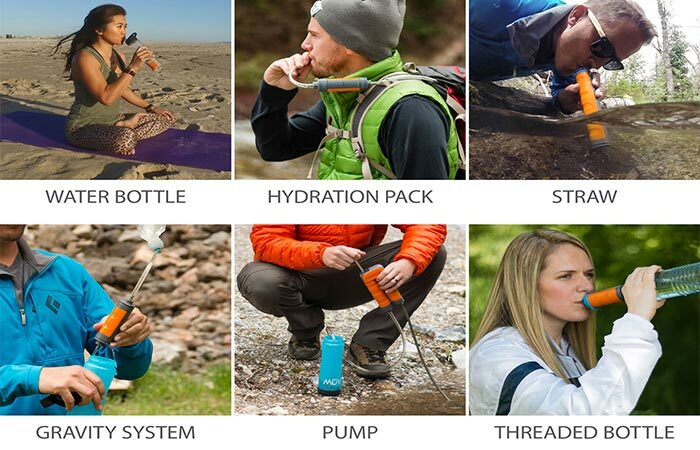 But that’s not all, the MUV is adaptable, which means that you can use it in a water bottle, as a straw, in a hydration pack, as a gravity system, a pump and even on a threaded bottle. Check out the video below. At the moment, the MUV is on a Kickstarter campaign, so if you’d like to get your very own modular water filtration system, you should go check it out.